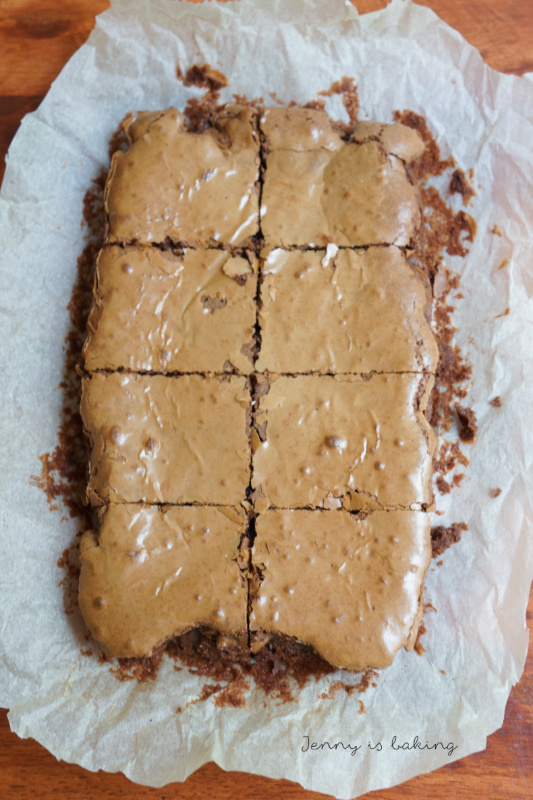 If you ask me which recipe is universally loved around the world, I would say it is brownies. Chocolate in cake form, a delicious square, which can be prepared in under twenty minutes and is the traditional crowd pleaser. Brownies make me happy, brownies are comfort. They are so simple and easy! Oh, and in case you forgot, they have everything to be in chocolate heaven: lots and lots of high quality chocolate, butter, eggs, and sugar. I don’t know about you, but brownies are something special to me. Sometimes brownies need to be more like a chocolate cake, filled with walnuts, sometimes I prefer brownies to be more fudgy with a gooey center. 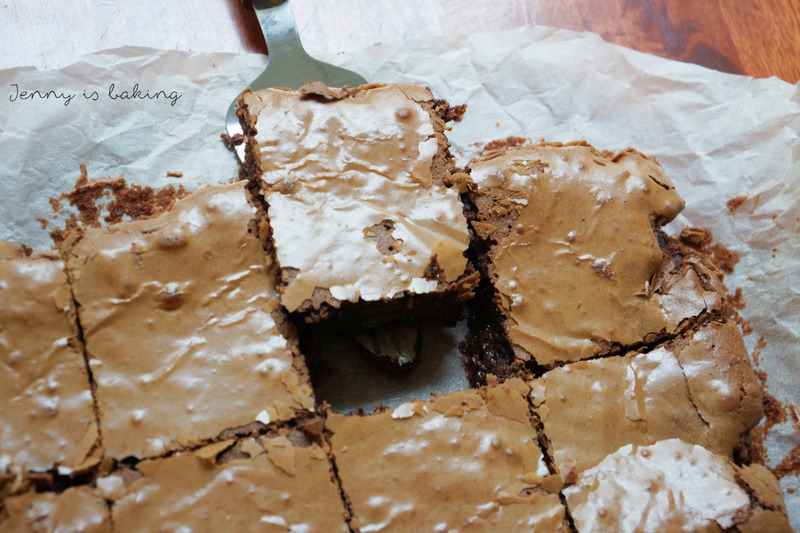 Among the many brownie recipes, I decided to go for the one from Tessa for this blog entry. She experimented a lot to find the perfect recipe, check out her blog, she gives good explanations as to how each ingredient has an impact on the final result. 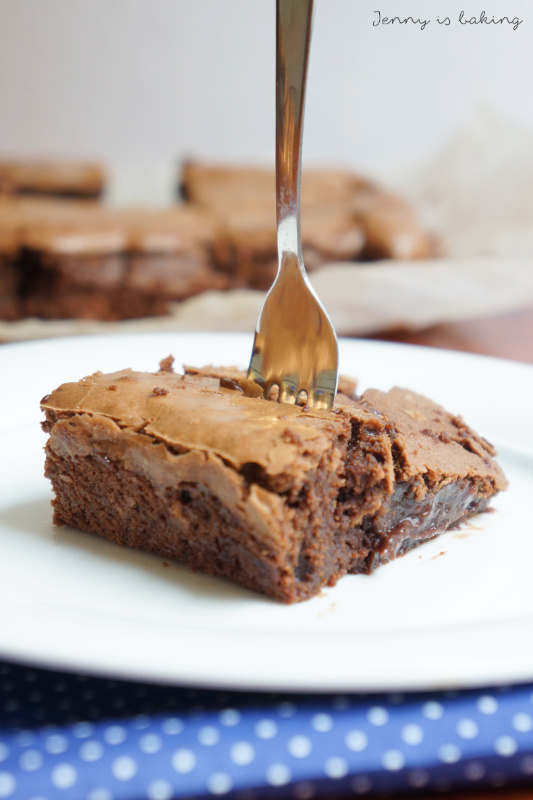 This brownie is definitely more of the fudgy kind. If you want something more cakelike, look elsewhere. This brownie has a gooey center and a rich chocolate flavor. No, there is nothing healthy about this, on top of the large amount of chocolate, you add a lot of eggs and butter. But if you want to indulge yourself, this is it. Dig in! Put the butter, chocolate chips and chocolate into a pot and melt on low heat. Stir constantly while butter and chocolates melt. Make sure that chocolate doesn’t burn. It will take about five to eight minutes due to the low heat. Cool off once completely melted. In a large bowl beat the eggs with the sugar for about three minutes with a hand mixer. The color should become lighter and the batter thicker. Then add the vanilla. Preheat oven to 170 degrees Celsius and line a typical lasagna form with parchment paper. Pour the cooled off chocolate mix to the egg mix with a spoon. Gently fold in the flour and salt. Don’t overmix. Bake for about 40 minutes on middle rack. Toothpick does not come out clean as the center remains rather soft. Brownies are easier to cut if chilled. Really make sure you don’t burn the chocolate. As I don’t own a microwave and find it complicated to melt my chocolate in a pot inside a pot with boiling water, remember to stir all the time and to have it melt on low heat. Chill the brownies before cutting them into pieces. For someone who’s just getting into it, what tips/tricks do you have? Hi Andrew, You can read some tips at the very end of the recipe. Don’t burn the chocolate (you can microwave it in small intervals too and stir in between) and don’t over mix when you add the flour at the end. Apart from that there is not that much to consider. Happy to hear how they turned out! Hi Andrew, Oh and another hint: if you are a beginner, follow the recipe as much as possible and don’t substitute any of the ingredients. Very happy to hear that! It even saves you the hassle of transferring everything from the cup to the bowl. You pour everything directly to the bowl! A food scale is a really good investment and much more precise! This looks tempting. Like look at those glancy part of the brownies. These are fabulous! 😀 Gut gemacht Jen! Thanks, Aldrin. They are as good as they look!